The enforcement of the Sugar Act by the British in 1764, the Stamp Act of 1765, and the Townsend Acts of 1767 and other claims against the colony produced a stagnation of business and general resistance in the Colony of Rhode Island. Initially, this took the form of quick raids against British vessels that had been placed in Narragansett Bay and along the coast to stop illicit trade. These included boarding and burning of the sloop Liberty in Newport in 1769 and the Gaspee in Pawtuxet in 1772. Defiance had also taken place in Boston with the Boston Tea Party in 1773. The battles of Lexington and Concord and at Bunker Hill would occur in less than two years. With increasing threats to commerce and liberty, it is no wonder that militia units sprang into service. The Pawtuxet Rangers or Second Independent Company for the County of Kent, were chartered by the Colony of Rhode Island and Providence Plantations on October 29, 1774 to protect the village of Pawtuxet, which was a thriving fishing village and a seaport very busy with commerce. The initial officers being: Samuel Aborn, Captain Benjamin Arnold, First Lieutenant, Rhodes Arnold, Second Lieutenant and Stephen Greene, Ensign. The responsibilities of the Company soon expanded to include the construction and manning of the fort on Pawtuxet Neck, thereby helping to protect the 400 miles of Rhode Island coastline from incursions by the Royal Navy. Since Newport was occupied and burned during the war, as was Bristol, the need for the militia proved to be real. The entire Company was listed “on duty” at the fort in Pawtuxet in July of 1778 under the command of Benjamin Arnold, Captain who would command the company until 1796. Members of the Company were on duty on Prudence Island and in Newport frequently between 1777 and 1781. I Simeon Smith of Cranston in the county of Providence & State of Rhode Island on oath do testify and say that I am now ninety four years old. That I was a private in a company called the Pawtuxet Rangers which company was under the command of Capt. Benjamin Arnold with the title of Colonel. Oliver Arnold was Lieutenant with the rank of Lieutenant Colonel. I was a private in the same from the beginning to the end of the war of the Revolution. During the time the British had possession of Newport, which was three years, said company, was on duty almost all the time. In the 1777 said company did as much as nine months service either in garrison duty in the fort at Pawtuxet or at place another stationed where it was ordered. Also in the year 1778 it was on duty almost all the time in the same manner, and also in the same manner in 1779 until the British evacuated Rhode Island. It is impossible for me to specify the particular months which said company was on duty, or was not on duty, they were on duty so much and so continually. And I further testify and say that I well remember a man named Stephen Fenner formally of said company and who moved away to the State of New York after the war and whose widow as I understand now resides in said State of New York. Said Stephen was a member of said company and was a sergeant in the same from the beginning of the year 1777 to the end of the war. He might have joined the company sooner but I remember him well as a member in February of said year. I had a dispute with him about the barracks while we were stationed at East Greenwich. He always performed as much service as any other member of the company. We served together at said East Greenwich one month and then went back to the fort. I also particularly remember that we served together at Bristol. Pawtuxet was a garrison town, and said company did duty in the fort. Our service in the fort was a military service for which we received pay and rations. Said Fenner did service in the same manner as myself and others in the fort. We were also stationed on Rhode Island as much as four months at different times, but the greater part of our service was at the fort at Pawtuxet and Warwick Neck where there was a guard house and where we were stationed several months. It was the duty of said company always to be in readyings to march to whatever station it was commanded either by the Governor or the General of the Army having the command in Rhode Island. It also had the principal charge of a fort built in said village of Pawtuxet to repel the incursions of the enemy which were very frequent during the time the British were in possession of Newport. While Rhode Island was the theatre of War, frequent & daring incursions were made all along the shores of Narragansett Bay by the enemy for the purpose of plunder and this Corps never failed to be among the foremost to repel them. 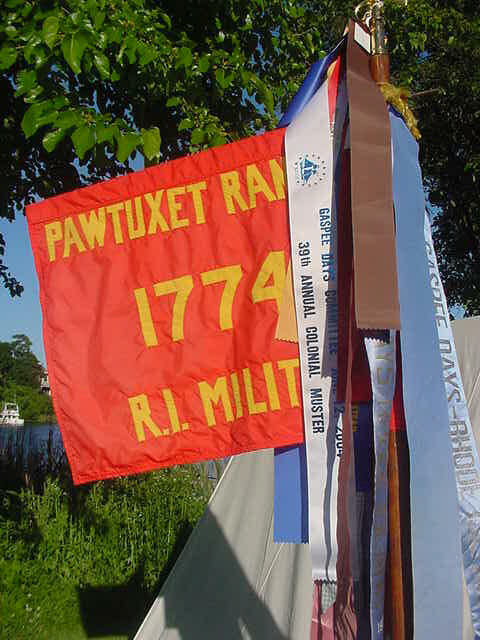 There were two types of military units during the Revolution: independent chartered commands, like the Pawtuxet Rangers, and Continental Regulars. General George Washington repeatedly commissioned these militia companies either for garrison duty or as auxiliary forces to the depleted Continental Line. 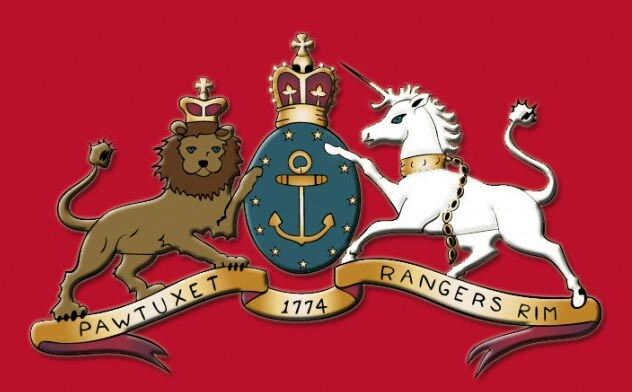 Members of the Pawtuxet Rangers served in many military actions: the Battle of Rhode Island, the Battle of Saratoga, and the Siege of Boston. Local history has it that the Pawtuxet Rangers escorted British prisoners from Saratoga through Pawtuxet on their way to Boston and with two brass French cannons which later were given to another unit by orders of George Washington.